The Royal Danish Mint has issued (15th February) two new coins with changes to the reverse design of the circulation 10 & 20 Kroner coins. 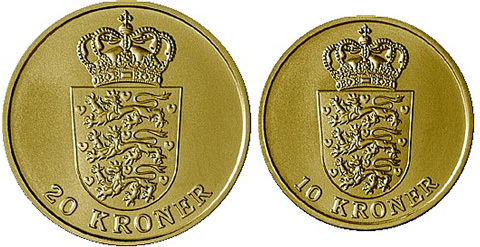 The new 2011 dated coins are designed by Royal heraldic painter Ronny Andersen and are quite reminiscent of the older 1 & 2 Kroner coins first issued in 1947 under the reign of the present Queen’s Father, King Frederik IX. The new design sees the traditional Danish coat of arms of the three lions passant, with the Danish crown over the shield. To mark this new issue, The Royal Danish Mint will offer these two coins in their base metal of aluminium-bronze as a limited edition set. The dies used for these limited edition coins are sand blasted and then glass blasted resulting in a uniform, matte surface corresponding to the engraved elements on proof versions of the coins. The process also includes a special medal minting press using several strokes to achieve a high quality. The two coins will be offered in Lucite capsules with a certificate of description. The obverse of the two coins carries the new elegant portrait created by sculptor Lis Nogel of Queen Margrethe II which was first seen on the commemorative coins issued for her 70th birthday last year.